Kildare South Fine Gael TD Martin Heydon has welcomed confirmation from Minister for Children Katherine Zappone that she recognises the increase in population in Co. Kildare which creates a strong demand for services. She gave these comments in a reply to parliamentary questions from Deputy Heydon on increased funding for Family Resource Centres included in the Budget. “Budget 2018 saw a 5.7% increase in the Budget for Tusla, part of which will go towards funding 11 new family resource centres around the Country as well as increasing supports to existing centres. With our growing population and high youth population Kildare needs more Family Resource Centres. 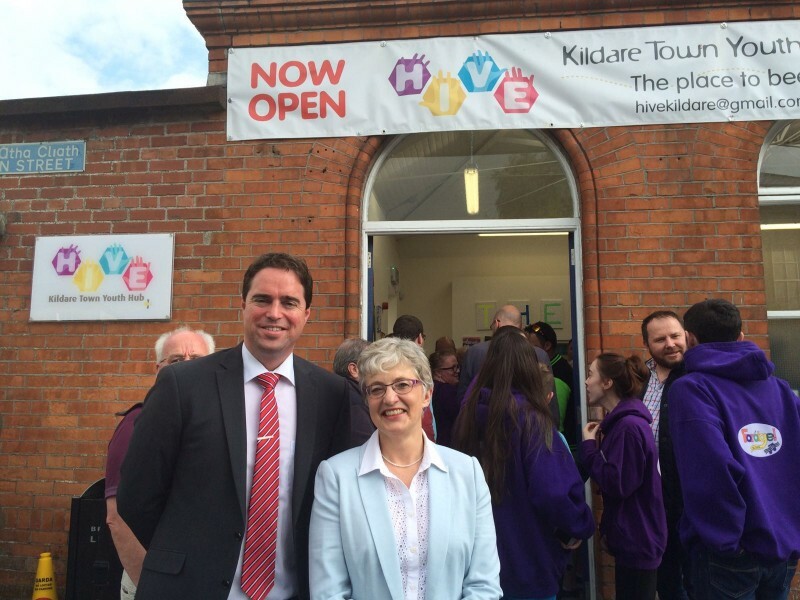 “I have already raised with the Minister the need for more Family Resource Centres in Kildare. For our growing population we are severely under-represented in terms of the number of family resource centres with only 2 in the whole County in Newbridge and Curragh when others such as Donegal and Kerry have 9 and 12 respectively. We are playing catch up here and I have been stressing this point to the Minister. “I was pleased to see that the Minister recognised that County Kildare has experienced a significant increase in its population base, and that there is a strong demand for services in the area. She acknowledged the two existing Family Resource Centres in County Kildare that receive funding from Tusla based in Newbridge and the Curragh and stated that the needs of County Kildare will be considered as decisions are made with regard to allocation of the additional resources provided. “The Newbridge and Curragh centers are great facilities which highlight what worthwhile services can be provided in our communities through these centres. Additional funding would allow them to offer increased services. “Other locations such as Teach Dara in Kildare town are already providing the services of a family resource centre on a limited budget. I will fight for Teach Dara to receive Family Resource Centre status and for the case to be progressed for family resource centres in towns like Athy, Castledermot and Rathangan. “I welcome the Minister’s confirmation that she will soon announce a process where those looking to be considered as Family Resource Centres will be able to apply and I will continue to follow up on this. For ORAL answer on Tuesday, 17th October, 2017. I am pleased to inform the Deputy that Tusla, the Child and Family Agency, will receive an additional €40.6 million in funding next year. This will bring Tusla’s allocation to over €753 million in 2018. The extra funding will support Tusla in delivering an ambitious and necessary programme of reform of services. I am placing a strong emphasis on the development of family support services next year. This includes the provision of additional funding to Tusla to expand the existing Family Resource Centre Programme, with 11 new centres to be included in the Programme. I am also providing Tusla with increased funding to support the existing Family Resource Centres across the country. I am doing this in recognition of the importance of early intervention and prevention in assisting vulnerable children and families in our local communities. I recognise that County Kildare has experienced a significant increase in its population base, and that there is a strong demand for services in the area. There are currently two Family Resource Centres in County Kildare that receive funding from Tusla. They are based in Newbridge and the Curragh. The needs of County Kildare will be considered as decisions are made with regard to allocation of the additional resources provided. Following on from Budget 2018, Tusla will shortly finalise details relating to the process for admission of additional centres to the Family Resource Centre Programme. I will also shortly be issuing Tusla with its 2018 Performance Statement in line with the provisions of the Child and Family Agency Act, 2013. Tusla will, in response to the Performance Statement, prepare a Business Plan for 2018, having regard to the overall level of funding available in 2018. Tusla’s Business Plan for 2018 will set out details of the additional funding to be provided to existing Family Resource Centres next year, and this will be submitted for my consideration. In conclusion, I would like to acknowledge the valuable work of Family Resource Centres. I am pleased that I have secured additional resources to support them in their work with vulnerable children and families in our local communities.